So, I've decided to take the challenge! 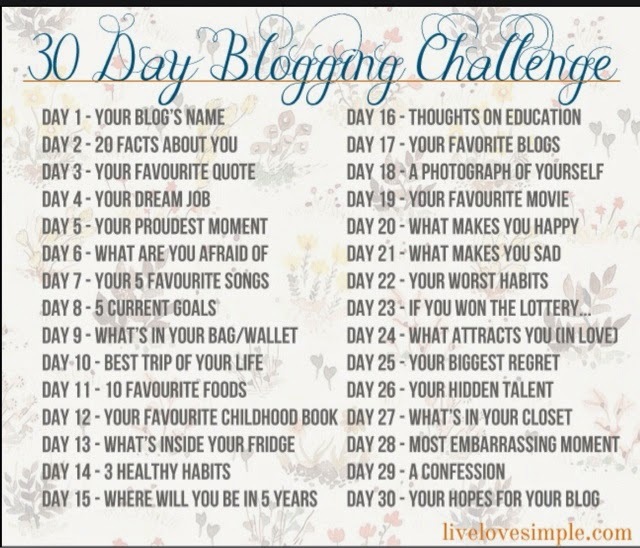 I might change it up because look at day 24. No. Thank. You. I didn't really understand this one so I'm just gonna do what I think it is. My blog's name is Amazing Life Being 10. There is really not much to it. It's basically saying: I have an amazing life being 10 years old! Ya with me? I hope so. At first, my blog's name was Adventures of A Wonder Kid but when I turned 10, I liked "My Amazing Life Being 10" better so I changed it. I did not change the web address because a lot of people linked to my blog from their blogs so I did not want the link to be broken. Well, there is the basic story of my blog's name. Tune in tomorrow for 20 (maybe 10) Facts About Me! Thanks so much Julia! I appreciate the amazing comment! I love WWE - do continue it and this is great I love this 30 day blogging challenge, I'll be back everyday!